Officer Darren Wilson of Ferguson Missouri Police department. His victim Michael Brown does not have the same options or freedoms as Officer Darren Wilson because he’s dead. 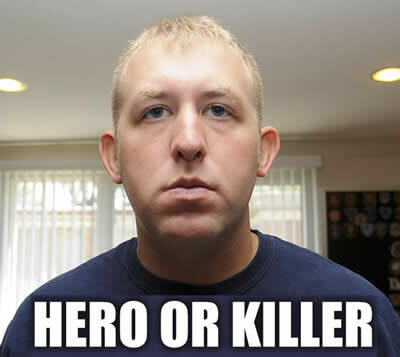 Holding a gun Officer Darren Wilson pretended to be brave however now that public opinion and news about his history and youth have surfaced he’s not so brave. False stories are being spread to support the poor actions of Officer Darren Wilson. Claim: Image depicts injuries suffered by Ferguson, Missouri, police officer Darren Wilson following an altercation with shooting victim Mike Brown.